Comments: Broadleaf evergreen tree native to Central Mexico. 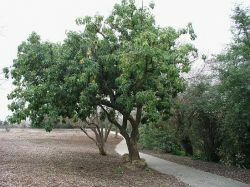 Sapote has been cultivated by the various Mexican civilizations for at least 1000 years. The fruit of the Sapote is sweet and smooth thus earning the name Mexican custard. The specimen tree is 15 feet tall and broad spreading.